This Memorial is dedicated to all the women and girls for whom violence is a daily reality to those who have died as a result of violence, and to all the women and men who work to end it. 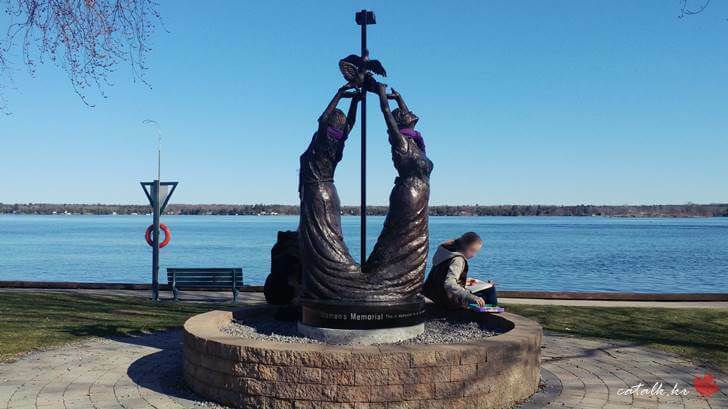 The Women’s Memorial was dedicated on November 18, 2010 at the Brockville Arts Centre during an unveiling ceremony entitled. “Voices of Hope”, a community celebration to end violence against women. 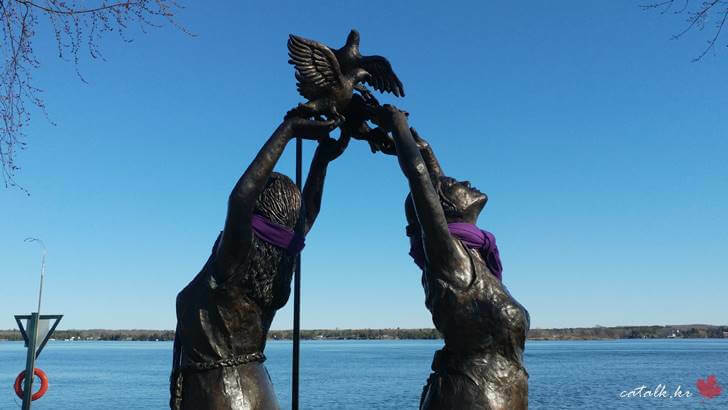 This Memorial makes a Permanent and public statement of the many women lost and honours and commemorates each life. Brockville community acknowledges such violence and the Memorial serves as a symbol of hope and healing and a future without violence. The Artistic Direction, Dave Sheridan and the students from the Thousand Islands Secondary School were responsible for designing and creating this magnificent state. I saw two purple scarves around their necks last weekend. It was warmer than the spring sunshine. Next to the memorial is the Aerobatic Fighter Jets of the Royal Canadian Air Force. It would be nice to look at it together. 방문자가 가장 많은 유네스코 세계문화유산 TOP 10, 한국 몇 위? 캐나다 퀘벡 몽모랑시 폭포 놓치면 후회해!